Where are the Great Smoky Mountains? The Smoky Mountains are a popular tourist attraction in the southeastern United States. The sun rises over the Smoky Mountains. The Smoky Mountains are a range of mountains found along the border between Tennessee and the North Carolina. They are a subrange of the Appalachian Mountains. The Great Smoky Mountains are sometimes referred to as the Smoky Mountains and occasionally shortened to Smokies. 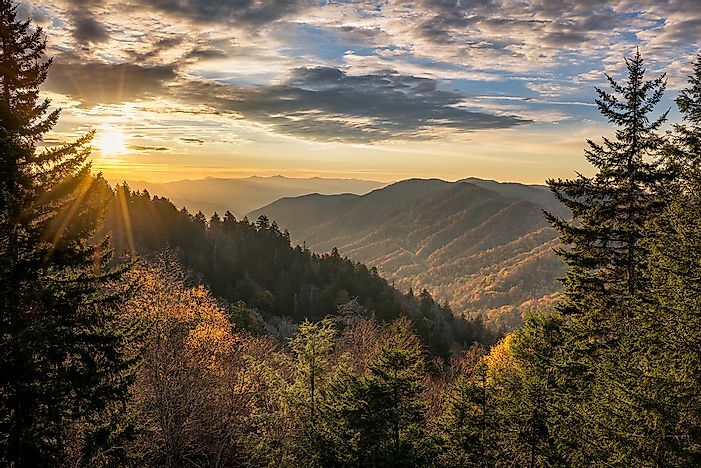 The range is popularly known for being home to the Great Smoky Mountains National Park that was established in 1934, and protects most parts of the mountain range. It is one of the country’s most visited parks with more than 9 million visits every year. Following the Great Smoky Mountains wildfires in 2016, the Smokies have received massive international media coverage. The Great Smoky Mountains are home to old growth forest covering an area of about 187,000 acres which constitute the largest of such forest on the eastern side of the Mississippi River. Cove hardwood forests are found in the range on the lower elevations of the Smokies, and they are among North America’s most diverse ecosystems. On the other hand, the range’s upper elevations are covered with Southern Appalachian spruce-fir forest which happens to be the largest of its kind. Besides, the Smoky Mountains are home to the most diverse salamander population found outside the tropics and also home to the densest population of black bears in the Eastern region of the US. The Great Smoky Mountains are part of an International Biosphere Reserve and have been designated as a UNESCO World Heritage Site. There are about 78 structures found within the national park that are preserved and maintained by the US national service. The structures were once part of the many small Appalachian communities that are spread across the coves and river valleys found in the range. The Great Smoky Mountains National Park also consists of nine distinct listings on the National Register of Historic Places together with five historic districts. The mountain range was given the name "smoky" due to the natural fog that is often seen hanging over the region. From a distance, the natural fog looks like large smoke plumes. The fog is mainly created when the vegetation in the range exhale volatile organic compounds. Such vegetation produce chemicals that contain high vapor pressure thus can easily form vapors even at normal pressure and temperature. The Great Smoky Mountains are home to numerous animal and plant species. Forests found within the Smokies are divided into three zones which are the boreal or spruce-fir forest, the cove hardwood forest, and the northern hardwood forest. In addition to these, there are also numerous species of wildflowers growing in the valleys and mountains of the Great Smokies. The range is also home to 66 species of mammals, 40 species of reptiles, 43 species of amphibians, 240 species of birds, and 60 species of fish. Tourism is a major activity in the areas surrounding the Smokies as it plays a huge role in the economy of cities such as Cherokee in North Carolina, Gatlinburg, and Pigeon Forge in Tennessee. The Great Smoky Mountains Heritage Center was opened in Townsend in 2006, and its main aim was to preserve various aspects of the region’s culture. Activities such as rafting or skiing are a common activities during summer and winter seasons. This page was last updated on September 6, 2017.